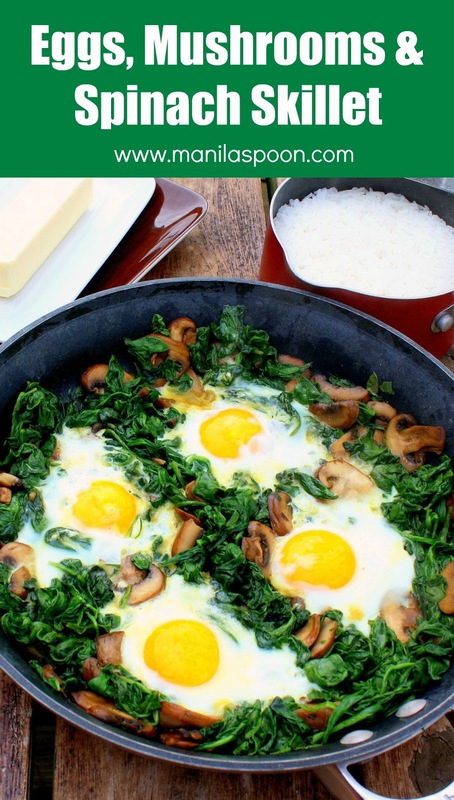 A delicious breakfast or brunch dish – Eggs, Spinach and Mushrooms Skillet. All done on the stove top. Naturally nutritious, low-carb and gluten-free! 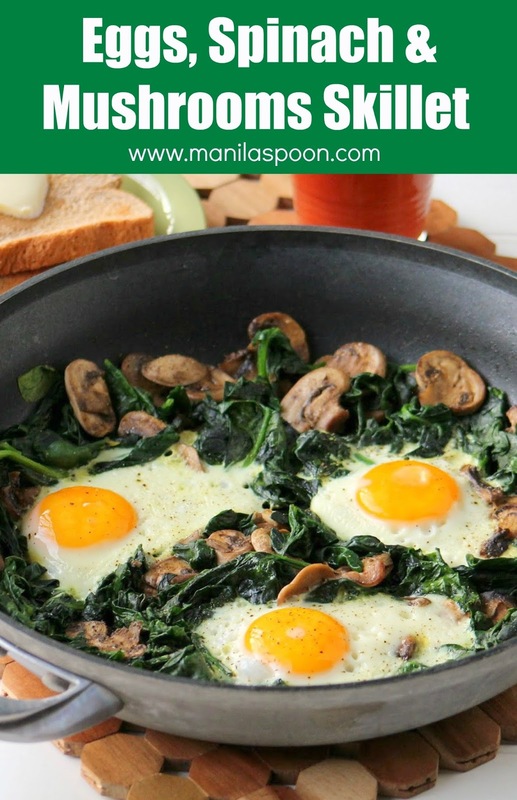 If you are a follower of this blog or our Facebook page you would notice that I love to have eggs, spinach and mushrooms for breakfast. I have a few recipes that feature all these three ingredients together in one dish. I think they all work together well that’s why. The texture and flavors of each of these lovely and nutritious ingredients all combine to produce a delicious breakfast dish. However, when you have the same recipe all over again you get tired of it no matter how great it is. That’s why I make a rotation for these ingredients. I don’t cook them together in the same recipe all the time. I try to make variations whenever possible. Here’s another lovely recipe using this three ingredients which this time does not involve the oven but just a skillet on the stove top. Easy and pretty to. Now, depending on how big your skillet and the number of people you want to serve this – you can make up to 5 eggs/5 servings in one go. Since we are only a family of 4, more often than not, we use 4 eggs for 4 servings though occasionally if it’s just me and hubby eating, we cut it down to 3 eggs. While Spinach is my favorite greens to use – feel free to use Kale or Swiss Chard if you like. Heat the oil in a large skillet or fying pan. Saute the mushrooms until they are tender and have fully released their water about 6-8 minutes. Set Aside. about 2-4 mins. Use either your hand or a spatula to pack in the spinach. Dot each well with a little butter or spray with a little oil. Crack an egg on each well. Season the eggs with salt and pepper. Cook until the eggs are fully set or to your desired doneness roughly 5-6 minutes. Serve with toast or if you’re Pinoy, with rice of course. Enjoy! Thanks, Gabriele! So kind of you to feature this. We do love this recipe. Will check out your site pretty soon. Thanks for the kind invitation. Thanks, Sharon, glad you enjoyed it. Thanks for letting us know and the addition of tomatoes sounds delish! Recently, I was in an ice storm and was afraid my electricity would go out, so I made this recipe to have in case I needed some food. Turns out, the electricity did not go out, and all was good, tasty and warm. I love this recipe so much that I would eat it cold! Looks Yummy, can't wait to try it. Looks awesome… I’m trying this recipe. Did you know mushrooms don’t need any oil to cook? Slice mushrooms , heat a dry skillet, Add the mushrooms and salt them a bit to extract the mushroom liquid. The mushrooms will spit and brown up naturally with out any fat. I share it with everyone. Nicely explained, I actually made eggs spinach and mushrooms today for my family, it tastes delicious. It is a guaranteed method of fast cooking and does retain the nutritive value of food.